Equipped with a powerful Briggs & Stratton 625 series engine, this petrol scythe mower has a single mulch bar with height adjustment skids (from 20mm to 50mm) and cutter bar clutch. This versatile and manoeuvrable 87 cm cut scythe mower is durable enough to cope with tall grass as well as thick, matted weeds, making it perfect for use in wildflower meadows or natural gardens. This 87 cm cut scythe mower is powered by a 190 cc, 2.4 kW Briggs & Stratton engine, and is ideal for use in grassland meadows or wilder gardens where long grass or thick weeds are present. This scythe mower with a cutting width of 102 cm is ideal for high-grass meadows and natural gardens, able to cut tall grass as well as thick and matter weeds. With a movable deflector and durable design. 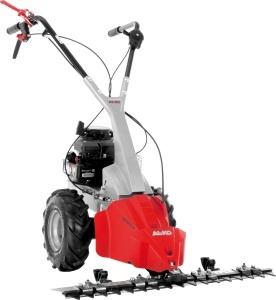 With a choice of engines and cutting widths available, you can tailor this machine to suit the job you need it to do, whether cutting grass in small, tight spaces, or over wide, open areas. Powered by a Honda GP160 engine, featuring two forward and two reverse speeds and locking differential, this machine is ideal for versatile operation and impressive mowing performance. With a powerful and reliable Honda GX270 engine, the BCS 615SL power scythe is a great choice for cutting 1-5 acre plots. It also offers even more versatility than the standard 615.